Cypress and Murray River sea salts, butter toffee, candied orange peels and ginger root, whole vanilla beans, fresh lavender flowers, organic Oregon chai, basil, and pink grapefruit. We here at the Gourmet Chocolate of the Month Club are truly excited to bring you a new chocolatier from Charlotte, North Carolina: The Secret Chocolatier, a true family business that has been creating artisan, hand-made chocolates and confections since 2008 and opening their first retail store in 2011. Chef Bill Dietz learned his craft at the knee of his Pennsylvanian grandfather who owned and ran a local bakery outside of Pittsburgh, PA. As a young child, he learned how to make pastries and doughnuts among other things. After high school he joined the military, and once he returned he pursued a career as a pastry chef. That pursuit carried him over thirty years from Myrtle Beach’s Grand Strand and Columbia, South Carolina to the Sonoma Group in Charlotte, North Carolina, where he worked as executive pastry chef for three acclaimed restaurants and developed and perfected his love for chocolate. When his restaurant closed in 2007, he found himself at a career crossroads. 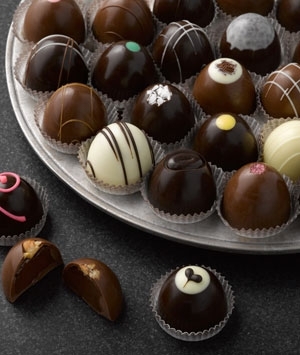 He longed to work with chocolate more intensively and called a family meeting with his wife Karen, daughter Robin, and Robin’s husband Andy, and together, they started creating chocolate truffles to sell at local farmer’s markets. After a few years of farmer’s markets and having developed a local following, the Dietz and Ciordia families knew that a storefront was inevitable. In 2011, The Secret Chocolatier opened its doors and Bill’s dream had become a reality. As the company grew, so did the talents of the family running it. Bill’s wife Karen provides the charm and conversation to visitors in our shop. Her friendly disposition led her to a career in church, and now she brings her listening skills and desire to make people happy to the family enterprise. The highly-kinetic Karen also creates infusions, and hand-shapes our delicious chocolates when her husband needs her delicate touch. Following her father’s footsteps, Robin found she had inherited the knack for dessert creation. She spends her time balancing her work in the kitchen with her sales and bookkeeping roles. Robin’s husband Andy is the Swiss Army Knife of the company. He fits in wherever he’s needed, but his strength is in marketing and business management. The youngest chocolatier is five year old Logan and is the true charmer. He can be found making limited edition chocolate bark for charity called Logan’s TLC (The Littlest Chocolatier) Bark and greeting all the customers with his beautiful smile. The Secret Chocolatier offers selections of unique chocolate confections including cakes in a jar, toffees, brownies, truffles, and bon bons, just to name a few. They also have an extensive collection of seasonal delights. For Easter you can expect to find fluffernutter filled eggs and vanilla bean buttercream filled bunnies, for Mother’s Day you can try the strawberry cream cakes, or for St. Patrick’s Day try the white cream cheese cake with mint buttercream and a white chocolate shamrock. No matter what the season you can always find the perfect treat. They use fresh seasonal ingredients from regional farmers to create their unique flavors. There are no extracts or oils used. Everything is processed in a cream steeping method to bring out the peak flavors. As a rule, they have decided that the best can’t be tampered with. To gain longer shelf life, temperature stability, etc., requires the introduction of a lot of science, and that pushes the natural out. It’s a difference that you can sense – that you can taste – so The Secret Chocolatier rejects such artificial approaches in favor of pure, all-natural ingredients and processes. They strive to stay as close to the source of all their ingredients as possible. In the summer, try their lavender or basil truffles, or try the cherry hot chocolate in the winter. For every season, there will be something new to try and that will have any chocoholic’s mouth watering for more. 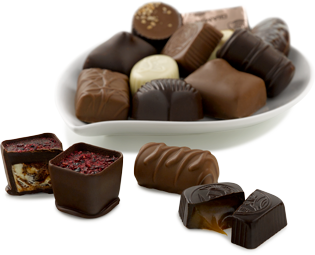 To learn more, visit their website at: www.thesecretchocolatier.com. Sea Salt Chocolate Butter Toffee- 1/2 lb of rich, buttery toffee coated with a thin layer of dark chocolate and sprinkled with Cypress Sea Salt. Enrobed Brownie Bar - A fudgey, chocolate chunk brownies, coated in chocolate. Vanilla Bean Buttercream Bon Bon- Whole vanilla beans in our buttercream filling with a thin chocolate shell. Lavender Truffle - Fresh lavender flowers steeped in cream create this bright, floral taste. Chai Truffle - Organic Oregon Chai steeped in the cream of this flavorful truffle. Basil Truffle - A seasonal favorite! Fresh basil leaves from the garden are used to create this unique, favored truffle. Pink Grapefruit - Bright citrus flavor with a background note of tartness from the grapefruit. Dark Chocolate Sea Salt Caramel - Salty sweet at its best! Creamy, soft to the tooth caramel, coated in tempered dark chocolate and lightly salted with Murray River Sea Salt. Chocolate Bourbon Pecan Pie Bite - These are little bourbon pecan pies wrapped in chocolate. Two or three bites of satisfaction. Utilizing great ingredients like southern pecans, Knob Creek bourbon, and Golden Syrup will make your mouth dance and give you a very happy belly.